Show off our amazing navel bars to which are available in a wide range of designs, shapes, colours and materials to suit your style. You will love our fashionable and colourful navel bars perfect for everyday wear, parties and concerts. Here at bodyjewelleryshop.com we have something for everyone! 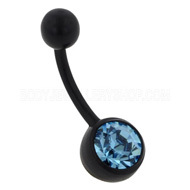 Unleash your sweet and playful side with this cute crystal steel belly bar. The flat disc features a crystal cherry design with sparkling silver jewels around it. Watch these attractive crystals shimmer in the sunlight all day long. 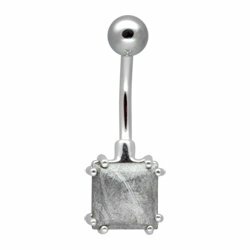 This belly bar will look gorgeous with any outfit you decide to pair it with and it will feel really comfortable to put in your piercing. Slip this smooth and skin-friendly steel bar through your navel piercing; it will add a touch of glitter to the dance floor. This gorgeous inexpensive belly bar will make a great gift to a loved friend, partner or family member for a special occasion. Make a bold statement by wearing this bright neon green UV bananabell which will glow all night long. The vibrant colour will look eye-catching and will coordinate with almost any outfit. Comfortable to wear and stops irritation, this UV belly bananabell will stand out from the crowd and will compliment your bubbly personality perfectly. Have a look at our fantastic threaded accessories and remove these balls and change them for a completely different look altogether. Everyone will love this simple yet attention-grabbing green body jewellery piece which is available in a range of our colours to pair with your favourite clothes. This entry was posted in Belly (Navel) Piercings, Navel Bananabells, Surgical Steel Body Jewellery and tagged Bananabells, Belly (Navel) Piercings, Belly Bar, Belly Bars, Belly Button Bar, Belly Piercing, Belly Piercing Bar, Cute Belly Bars, Navel, Navel and Belly, Navel and Belly Button Jewellery, Navel and Belly Piercings, navel bananabells, Navel Bar, Navel Bars, Navel Jewellery, Navel Jewels, Steel Jewellery, steel piercing jewellery, surgical steel piercing jewellery, uv bananabell, UV Belly Bars, UV Body Jewellery, UV Jewellery, UV Piercings on August 31, 2011 by Piercing Guru. When it comes to comfortable navel jewellery, you can’t beat BioFlex navel rings. BioFlex is a revolutionary material for navel rings, a special type of biocompatible plastic that gives you complete comfort and actually helps to reduce healing times. Here at Body Jewellery Shop we have a great choice of BioFlex navel rings, some of which you can see below. BioFlex is very bendy and soft, so it moves with your body and reduces stress on the piercing. It is also completely biocompatible and non-irritating, so it is ideal for sensitive piercings and can even help your piercings to heal. It is also non-stick, which makes these navel rings much easier to keep clean. These BioFlex navel rings have the same basic shape as traditional metal belly bars. They are easy to use and come in a fantastic choice of cool colours and glamorous jewels. I would recommend these highly, especially if your navel piercing is often sore or your jewellery gets caught on clothing. Because these navel rings are flexible they are less likely to get caught or press uncomfortably into your skin. This entry was posted in Belly (Navel) Piercings, BioFlex Body Jewellery, Navel Bananabells and tagged Belly (Navel) Piercings, Belly Button Navel Ring, Belly Button Navel Rings, BioFlex Body Jewellery, BioFlex Piercing Jewellery, Bioplast Body Jewellery, Bioplast Piercing Jewellery, Navel, Navel Accessories, Navel and Belly, Navel and Belly Button Jewellery, Navel and Belly Piercings, Navel Bar, Navel Bars, Navel Jewellery, Navel Jewels, Navel Ring, Navel Rings on March 8, 2011 by Piercing Guru. Piercing jewellery needn’t be expensive and now you can find an amazing range of cheap piercing jewellery that doesn’t compromise on quality. After all, poor quality piercing jewellery can irritate your piercings or even stop them healing, so itâ€™s just not worth settling to anything less than the best. Here at Body Jewellery Shop we have an excellent choice of cheap piercing jewellery under Â£5, including the most popular designs and top quality materials for less. Navel piercings are very popular, which means that there is a huge choice of cheap navel piercing jewellery out there. Plain surgical steel bananabells are always good value for money but if you want to make more of a style statement without breaking the bank, there are a few things to look out for. PMMA acrylic is one of the cheapest materials for piercing jewellery but it is very comfortable to wear. I recommend an all-acrylic bananabell like the blue one below, or one with a steel stem and acrylic balls, like the neon purple one. Both of these bars are excellent quality but still under Â£3. This entry was posted in Belly (Navel) Piercings, Eyebrow Piercings, Navel Bananabells and tagged Belly (Navel) Piercings, Body Jewellery, Body Piercing, Eyebrow Jewellery, Eyebrow Piercing, Eyebrow Piercings, Navel, Navel and Belly, Navel and Belly Button Jewellery, Navel and Belly Piercings, Navel Bar, Navel Jewellery on December 14, 2010 by Piercing Guru. Navel and belly button jewellery is designed for belly piercings. 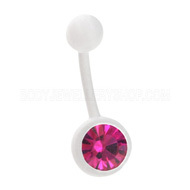 Navel and belly button bars come in many varieties, with a fantastic choice of materials and colours to choose from! Navel and belly button jewellery includes navel bananabells, belly bars, navel rings and navel accessories. Navel and belly button jewellery includes a choice of acrylic navel bars, ultra violet belly bars, blackline belly button bars, zircon gold navel bars, surgical steel navel bananabells, titanium belly bananabells, bioplast navel bananabells, natural gemstone belly bars, glow in the dark belly bars, gold plated belly bars and many more. Navel and belly button rings can be worn in your navel piercing, including ball closure rings, circular barbells andÂ body spirals. Navel rings are available in many different designs, colours and materials. Navel and belly button rings can be accessorized with captive (clip in) accessories such as jewelled balls, charms and accessories. Customizing your navel and belly button bars has never been easier! With a simple navel accessory, you can change your look within seconds. Choose from our great range of navel and belly button charms, navel rounders, navel orbitals andÂ navel bananabell chains. Just simply add these navel and belly button accessories to your existing belly jewellery to update your look. This entry was posted in Acrylic Body Jewellery, Amber Body Jewellery, Ball Closure Rings, Belly (Navel) Piercings, Blackline Body Jewellery, Glow Body Jewellery, Gold Body Jewellery, Navel Bananabells, Organic Body Jewellery, Stone Body Jewellery, Surgical Steel Body Jewellery, Titanium Body Jewellery, Zircon Gold Body Jewellery and tagged Belly Bars, Navel and Belly, Navel and Belly Button Jewellery, Navel and Belly Piercings, Navel Bars, Navel Jewellery, Navel Rings on July 9, 2010 by Piercing Guru.